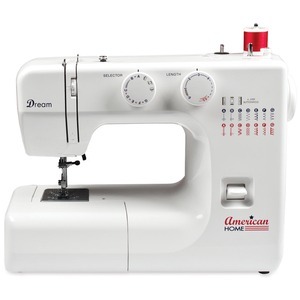 Foot controller to machine: 48"
AMERICAN HOME SEWING MACHINE 10 Stitch Model . From Stitchwoman, learn the basics of a standard mechanical sewing machine. This is based on the American Home sewing machine brand. 26 Minutes, 3700 Views. I've had this machine for 2 years. Although I've been sewing for 50 years I didn't want a computerized machine. I love this machine. It is lightweight, dependable, sews beautifully, and has just the right amount if decorative stitches. I also quilt, and sometimes I don't even need to use the walking foot. Experienced or newbee, this is a great little machine.